I recently bought a Groupon for Kai Sushi on Oak & 15th in Vancouver. It looked like an up-and-coming Vancouver Japanese-fusion sushi bar. Although not having a website, I did not have the chance to review menu prices before buying this deal. The Groupon cost $10 for $20 worth of food. For a Friday evening at 7pm, this restaurant was not particularly busy. There was still 3-4 empty tables so we did not have to wait for a table for two and we were given the option to pick a table to sit at. This restaurant looks quite new and very nicely decorated. We decided to order 4 dishes, as the first impression of the menu was it was a bit on the pricey side. The first dish that caught my eye was the Seafood Butteryaki, Kai’s signature grilled prawns and scallops for $7. 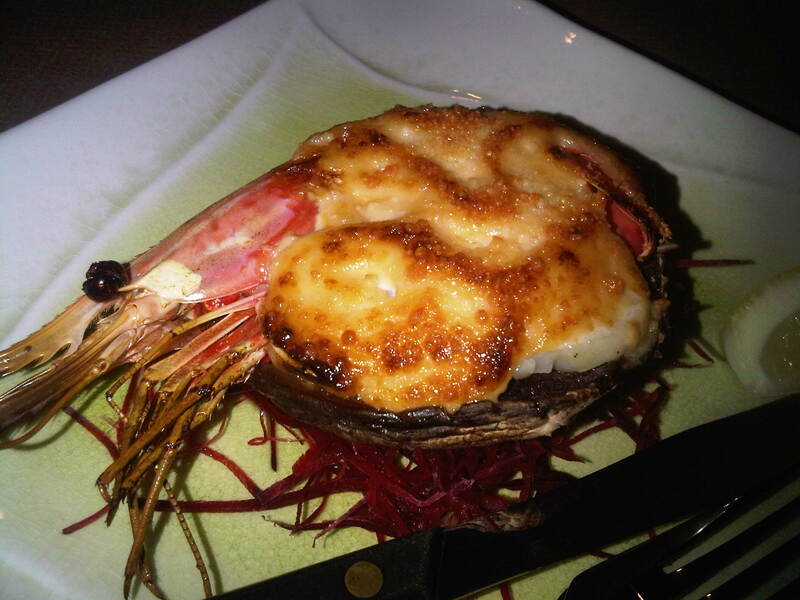 My guest wanted to order the Oyster Motoyaki, but our server Wayne highly recommended the evening’s special: amaebi (prawn) & scallop motoyaki baked on a portobello mushroom cap as the better bang for the buck ($12). We ordered the West Coast Roll, which consisted of dungeness crab, asparagus, and cucumber topped with nanuk smoked salmon ($13) and a special scallop roll ($7). The first two dishes to arrive were the Seafood Butteryaki and the Special Motoyaki. 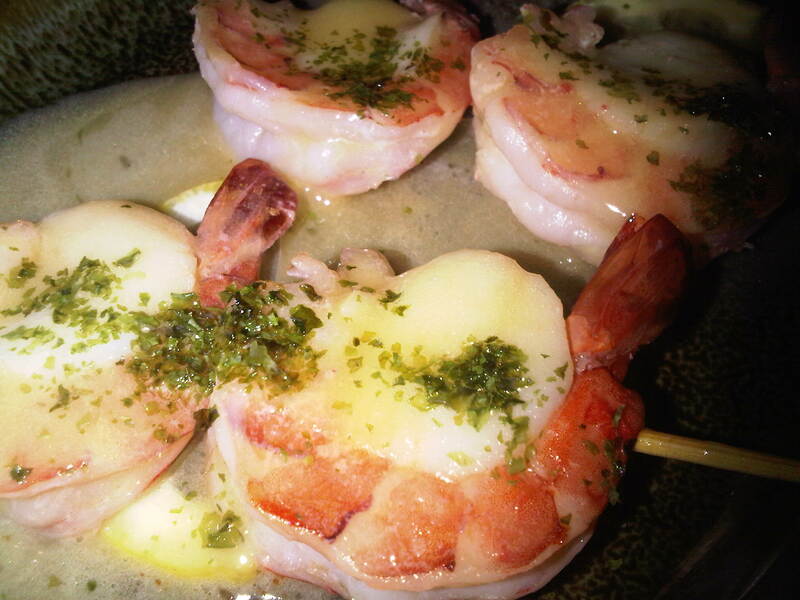 The Seafood Butteryaki was my favourite dish of the evening – two skewers of fresh prawns and scallops, bathing in a buttery citrus lemon sauce. Wayne suggested for us to eat it with more sauce, which I more than happily relished in. The texture of the prawns and scallops were cooked just right and very fresh. The special motoyaki was also well recommended, as the scallop was really fresh and the prawn was giant in size. The amount of mayo gave it the tangy flavour to compliment it to the portobello mushroom cap. However, the two rolls we ordered were a bit disappointing. For the cost of the rolls, these rolls were nothing special, similar to those of other sushi restaurants around town. The special scallop roll was just a regular scallop roll. I thought with the name it might have some other twist to it. 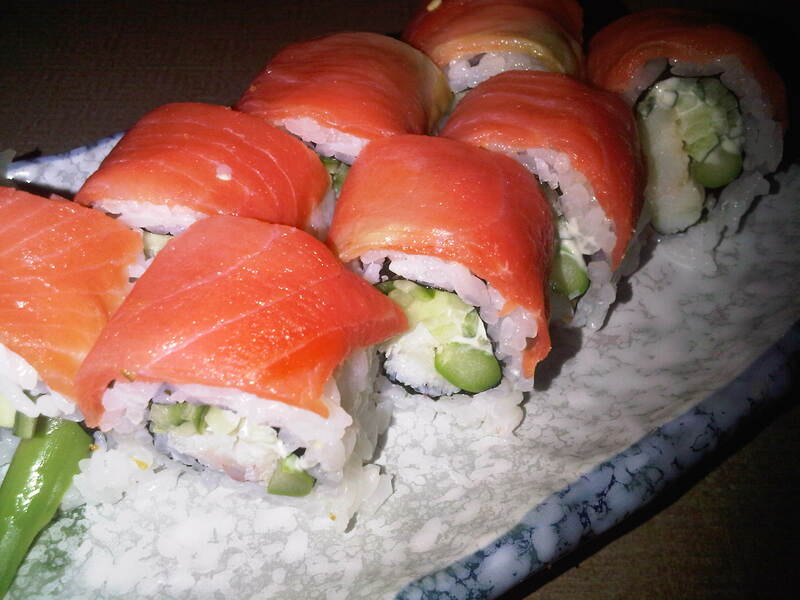 However, you can taste the freshness and quality of the seafood ingredients used within the rolls. Best to try the other specialty dishes instead or order the specialty rolls. Overall service quality was excellent. Our server Wayne was attentive, always refilling our tea, and making small chat like asking if this was our first visit, how we liked the food, etc. I would come back again but to order the specialty tapas dishes instead of the rolls. Even with the Groupon coupon, we still spent around $40 between two people for the 4 dishes and tea and did not feel particularly full. However, if you are looking for some specialty dishes such as the Seafood Butteryaki, and the wonderful service, give this new restaurant a try.